Tui Nature Reserve was our first project, and since then have built up a collective field of knowledge over the last eighteen years. Wildlife Protection Services has used their rodent detection team on many pest-free islands through-out the Marlborough Sounds, Auckland, Wellington and Abel Tasman regions. As well as in the sub-antarctics. 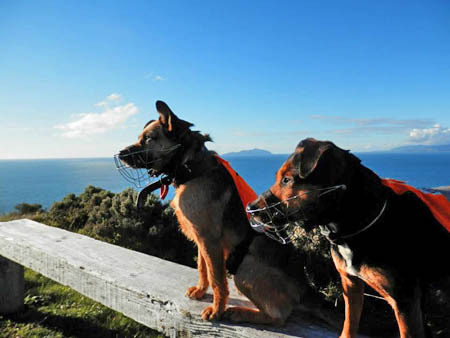 Working in the presence of endangered or rare species, the dogs are trained to a high standard which is certified by the Conservation Dogs NZ programme. GPS tracking/waypoints on satellite images, reports, photos, DNA samples of possible rodent evidence, feedback and recommendations are provided during/after the team's deployment. Each of these procedures requires a different approach to be most effective. The length of time before response or during operation depends on the size of the project and the circumstances. Most common length of time required by the team in good conditions to operate is an 8-hour day per 100 hectares for normal surveillance. This time increases depending on how thorough the search needs to be and in what conditions they are done, and also what the infrastructure and available resources are like. In the case of an island the service of a vessel will give more time to survey rugged and hard-to reach coastlines. The team provides their own safety gear under most circumstances, including first aid kit, GPS, PLB and high visibility. A radio and other forms of communication are usually provided by the project contracting the team, as well as the use of a Sirtracker.